You can count on us to install EV charging stations at homes and businesses throughout South & Central New Jersey. Over 100,000 electric cars were sold last year. You can charge faster and do it in half the time with a 240 V charging station over a 120 V outlet. Gibson Electrical will install a dedicated 240 volt circuit and your own electric car charging station. Make sure you have a qualified electrician install your new station and circuits as not to overload your existing electric panel. Businesses that people visit can benefit greatly having EV power stations installed. Restaurants, bars, shopping malls, hotels and strip plazas can benefit greatly by have the convenience of charging vehicle on site. 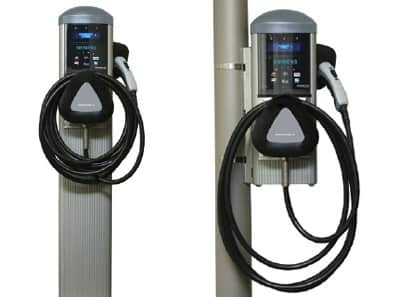 EV charging stations are much more than “extension cords” and intelligent communication systems are built into the station that interact with your car’s on-board computer to ensure a safe and complete charge. A study was conducted and showed that 43% of electric car customers will support and return to businesses with EV power stations based on convenience alone.